The final major piece of work on the topsides is the foredeck. 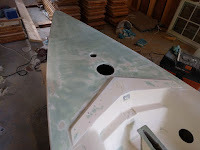 The laminate is very thin and the resulting lack of structure has caused the gelcoat to become a spiderweb of crazing. Fixing crazing involves opening up the crack with a dremel and following it for the length before filling it with fairing compound. 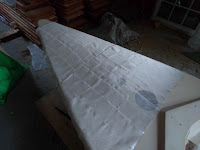 Unfortunately, I don't have the time or patience to fill the hundreds of crazing cracks that exist on the foredeck so I opted to cover the entire foredeck with 6oz cloth. This serves a dual purpose; covering the crazing and providing a little extra structure (although 6oz isn't much). 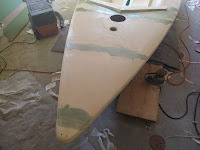 It's more of the same process as what I did on the hull, epoxy the cloth in place, then sand, fair, and sand some more. Repeat. When I got it to what I thought was satisfactory, I put a coat of primer on. 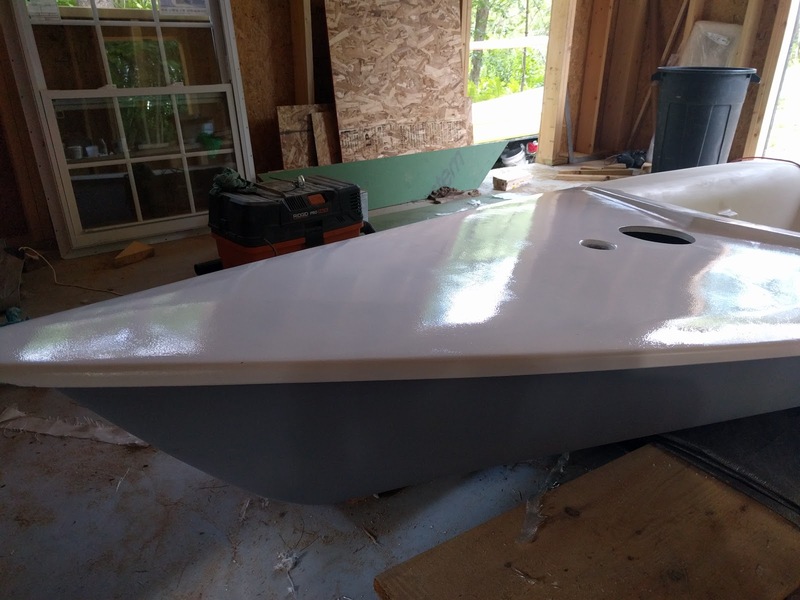 Still a few spots to take care of, but WAY better than before. 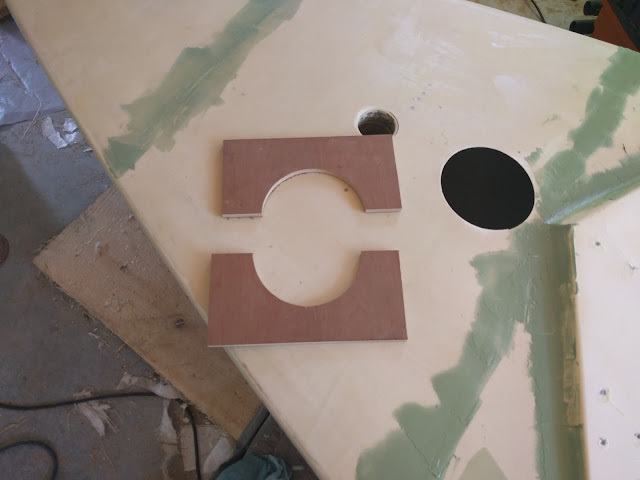 To add additional structure around the 6" cutout by the mast step, I opted to use a marine plywood ring epoxied in place surrounding the cutout. Using the roto-zip, I cut out the 6.5" hole (the 6" inspection port requires this size hole) in the plywood, then cut the entire piece in half so I could insert it into the hole for bonding. 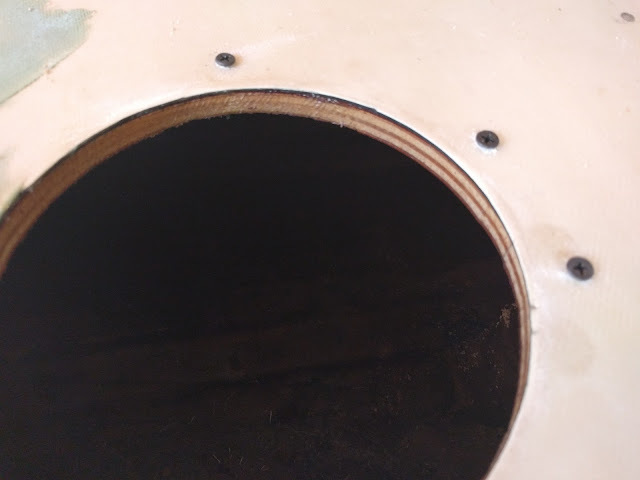 I saturated both halves with unthickened epoxy and then bonded it to the underside of the inspection port cutout with West 610 and screwed it in place from the top.